Of course! That's why I posted it buddy. Just realized i misspelled your name in the pic...need to check out new keypad apps. Using A-I, like it but it changes or omits characters at times. "Ultradoid" was totally unintentional. Now CLICKthat linkage and find all of your old and very first cellphone in that evolution tribute. 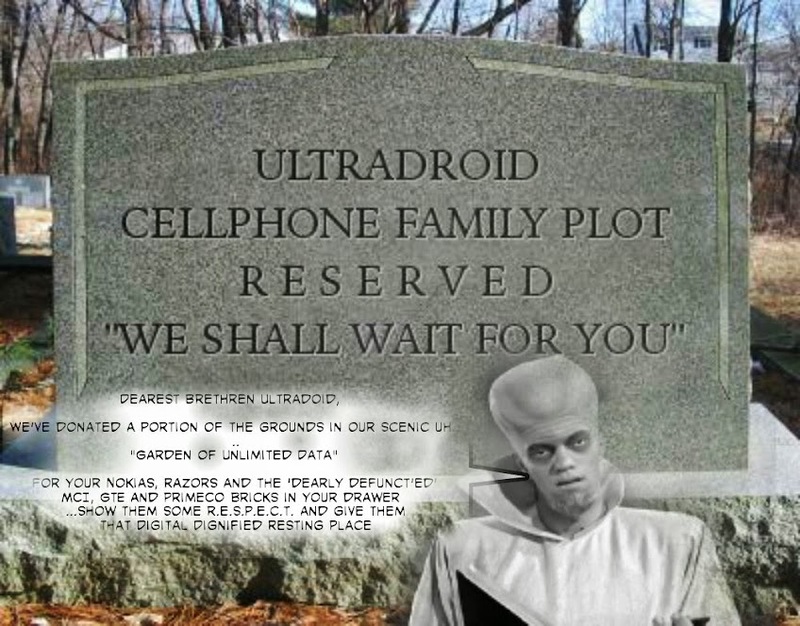 CELL PHONE SIM(ETERY) ANNOUNCEMENT: "The FIRST Memorial Service For A Galaxy Note 2! iN THE TEMPLE OF UNLIMITED DATA! Last edited by Rico ANDROID; 11-24-2013 at 12:34 AM. LOL! You're a sick puppy my friend! BTW, I ordered my Note 3 today from Amazon. Delivery by the end of the week! Hey thanks for showing up. Its creepy sittn in a funeral all my myself! I certainly know what you mean about money. I just happen to HAVE the Money this month, and I hate to *wait* for things I want. Lol i hear you, i was TEMPTED. BOY was i.
ROFL I remember this day! lol! St. Notus2Forumus CELL PHONE SIMetery Special! "Two For The Price of One"
Good Lordy! Are they making Cellphones ***THAT*** good these days that none are breaking! I mean, what are these manufacturers trying to do- Put CELL PHONE SIMetery out of bidness!?! SURELY someone out there has an old phone or recently departed (either by natural sim-causes or broken screen, fried innerds or have recently swam-in-the-drink!) !!! WE at Saint Notus2Forumus' CELL PHONE SIMetery are holding a special for the month of April 2015! TWO SIM-Lots for the price of one! (FREE!). C'mon and show our third-arms , our second brains, our personal sec's the dignity they deserve! DONT go throwing that thang back in a junkdrawar, taking a sledgehammer to it or shoving it down the food disposal? Lay them to rest in pieces after all the great services our devices have given us unconditionally! Leave your comments here , a brief Simbituary about your device and a pic if available. We will do the rest and announce the day of services! Last edited by Rico ANDROID; 03-22-2015 at 11:15 AM. What's with the t.e.d. and numbering your devives?